So earlier this year the metal scene was hit with a bit of a bombshell that Sodom's longstanding lineup had completely shifted and that Tom Angelripper would be the only remaining member of Sodom as he had brought in a whole new crew of musicians. This is the first time that we have heard material from this new lineup, and I have to say, not only am I extremely impressed at the over the top rip-roaring madness of the band but also hints at bold new directions for one of metals most established acts. 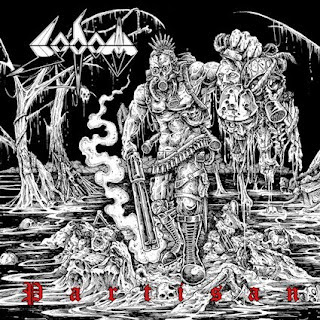 The traditional sodom elements are all here on this three track EP, Partisan, but the band also brings out so much more. As a four piece for the first time, it feels like Sodom are just starting to lean into what twin guitars can do without compromising their values and straying from that classic Sodom sound. Instead we find ourselves being beaten over the head with some of the most powerful thrash metal assaults I've ever sunk my teeth into. The lineup change has been like a shot in the arm for the Teutonic icons and now it feels like there is nothing that Sodom can't do, more crazed and over the top than ever before. this has always been ab and who refused to compromise. I mean their name is Sodom for Christ's sake. It's not like there was a lot of opportunity to compromise anyway. With a mere three tracks this EP might not represent a lot of material, but it's a potent hint at what more is to come. 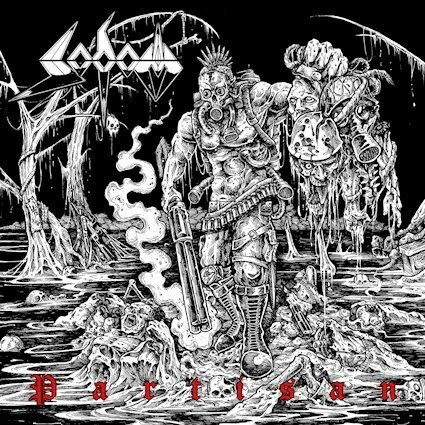 Sodom have continued to melt faces for years now and this new record with all of its gory political and war obsessed imagery shows the band retains their relevance even as we look towards the end of all things.